Back wearing, also known as Back Carrying, seems to elicit both interest and a little bit of fear from baby wearing parents. While Back Carrying is one of the most liberating types of carries–it enables you to be hands free and keep the baby safely from whatever you are doing–it seems to be one of the most daunting carries for parents. Back Carrying allows the parent to perform many tasks that would otherwise be difficult with a baby on the front. 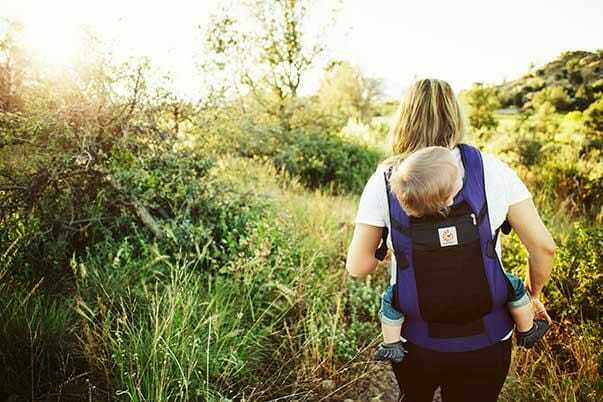 Of course, as with any carry, there are safety precautions, but when followed, the Back Carry can become an indispensible tool in the babywearer’s toolkit–grocery shopping, laundry, cooking, dishes, trips to the farmer’s market, for example–all become so much easier with the Back Carry! This is also an ideal carry for the baby to play or really observe the world around her. Historically, Back Carrying has been an essential part of life in many parts of the world. In many cultures, it allowed mothers to work while still tending to baby. Parents adapted the carry using a variety of materials, depending on the climate, the task at hand, and what was available to them. Thankfully today, carriers such as the soft structured carrier (SSC) allow a simple and easy way for the parent to practice this carry. With SSC’s it is recommended that the Back Carry is the third carry you attempt, and only once the baby is able to sit up on his or her own. Because Back Carrying centers the baby on the parent’s hips, the weight is easier to bear. A soft structured carrier is ideal for a Back Carry, as it supports the baby’s legs in a natural seated position. – To avoid injury when learning to place your baby in the carrier, do so over a bed or other cushioned surface or with the help of another person. – Back carries should only be used when your baby has a strong and consistent head and neck control, and hips and legs open naturally into a spread position. – Tighten shoulder straps to secure baby close to your body. If baby is hanging away from body or you feel it necessary to compensate for baby’s weight, then tighten shoulder straps more. But be sure not to over-tighten, baby should feel snug but still be able to move. – Baby should be centered in the carrier. Some bouncing up and down, while pulling carefully on one leg and the opposite side of the carrier, can be helpful in adjusting baby’s position in carrier. – If carrier seems to ride lower on baby’s back, pull up on shoulder straps and bounce slightly to encourage baby’s weight to fall farther towards the waist belt. This is very important: baby should be sitting fully in the pouch. Ultimately, carrying your child will allow for extended bonding while allowing the parent the ability to manage and accomplish daily tasks, as well as venture to out into the world. Carrying your little one on your back, rather than on the front, at the farmer’s market for example, can be quite liberating. Imagine how much easier it will be to pick up that bag of oranges with your baby safely and securely on your back, while she is still able to take in all the sights and sounds around her! While babywearing allows for both closeness and mobility for the parent, the Back Carry can open up an entire world for both baby and parent.